This year, the Catholic Church in the United States is being told she must “give up” her health care institutions, her universities and many of her social service organizations. This is not a voluntary sacrifice. It is the consequence of the already much discussed Department of Health and Human Services regulations now filed and promulgated for implementation beginning Aug. 1 of this year. So far in American history, our government has respected the freedom of individual conscience and of institutional integrity for all the many religious groups that shape our society. The government has not compelled them to perform or pay for what their faith tells them is immoral. That’s what we’ve meant by freedom of religion. That’s what we had believed was protected by the U.S. Constitution. Maybe we were foolish to believe so. In the public discussion thus far, efforts have been made to isolate the bishops from the Catholic faithful by focusing attention exclusively on “reproductive” issues. But the acrimony could as easily focus next year or the year after on assisted suicide or any other moral issue that can be used to distract attention from the attack on religious liberty. Many will recognize in these moves a tactic now familiar in our public life: those who cannot be co-opted are isolated and then destroyed. The arguments used are both practical and theoretical. The observance of Lent reminds us that, in the end, we all stand before Christ and give an accounting of our lives. From that perspective, I ask lay Catholics and others of good will to step back and understand what is happening to our country as the church is despoiled of her institutions and as freedom of conscience and of religion become a memory from a happier past. The suffering being imposed on the church and on society now is not a voluntary penance. We should both work and pray to be delivered from it. Over the last six months or so, the Catholic Church in the United States has found itself in some tension with the executive branch of the federal government over a very grave issue: religious freedom. 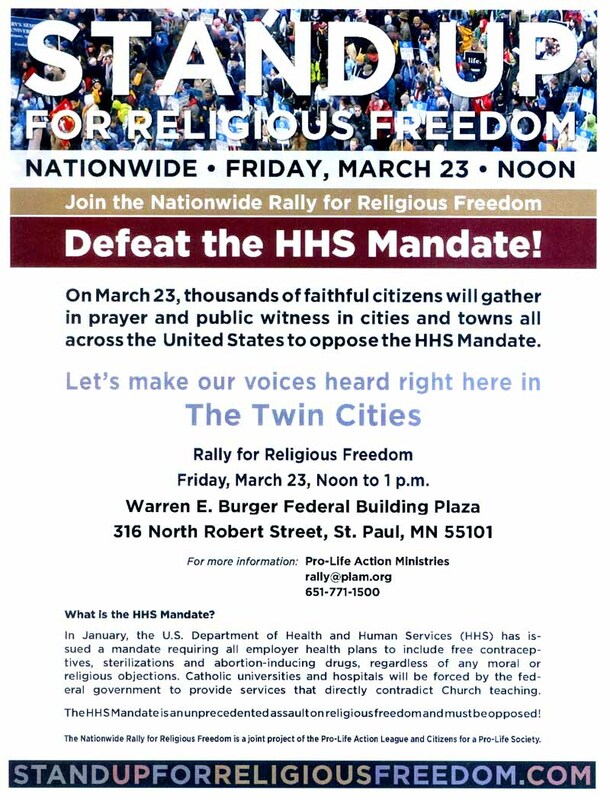 Can a government bureau, in this case the Department of Health and Human Services (HHS), define for us or any faith community what is ministry and how it can be exercised? Can government also coerce the church to violate its conscience? 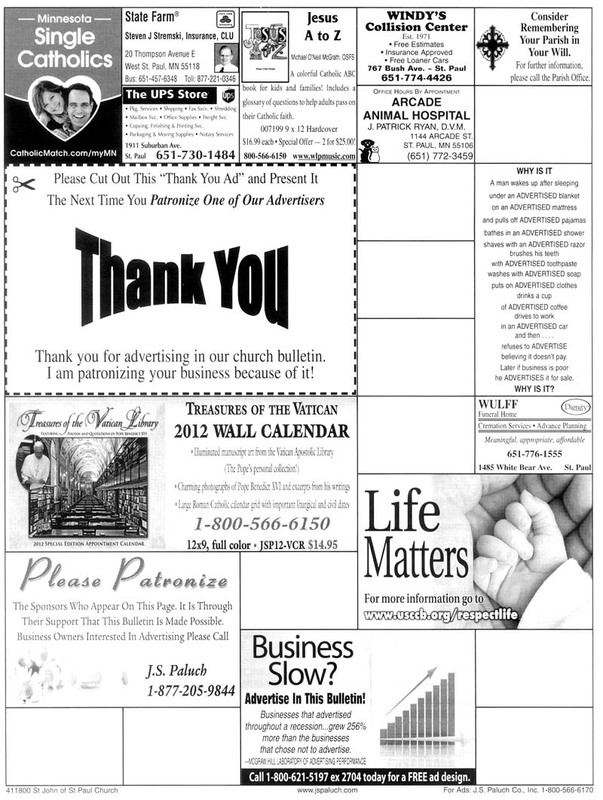 I wanted to let you, the great people of the archdiocese, know how we’re doing in this fight. Thank you for your extraordinary unity, support, and encouragement. Throughout all the archdiocese, our people – both as patriotic citizens and committed Catholics — have been very effective in letting government know that we are not at peace at all with this attempt to curtail the freedom of religion and sanctity of conviction we cherish as both Catholics and Americans. This has not been a fight of our choosing. We’d rather not be in it. We’d prefer to concentrate on the noble tasks of healing the sick, teaching our youth, and helping the poor, all now in jeopardy due to this bureaucratic intrusion into the internal life of the church. And we were doing all of those noble works rather well, I dare say, without these radical new mandates from the government. The Catholic Church in America has a long tradition of partnership with government and the wider community in the service of the sick, our children, our elders, and the poor at home and abroad. We’d sure rather be partnering than punching. And it is not just about sterilization, abortifacients, and chemical contraception. Pure and simple, it’s about religious freedom, the sacred right, protected by our constitution, of any Church to define its own teaching and ministry. When the President announced on January 20th that the choking mandates from HHS would remain — a shock to me, since he had personally assured me that he would do nothing to impede the good work of the Church in health care, education, and charity, and that he considered the protection of conscience a sacred duty — not only you, but men and women of every faith, or none at all, rallied in protest. The worry that we bishops had expressed — that such government control was contrary to our deepest political values — was eloquently articulated by constitutional scholars and leaders of every creed. 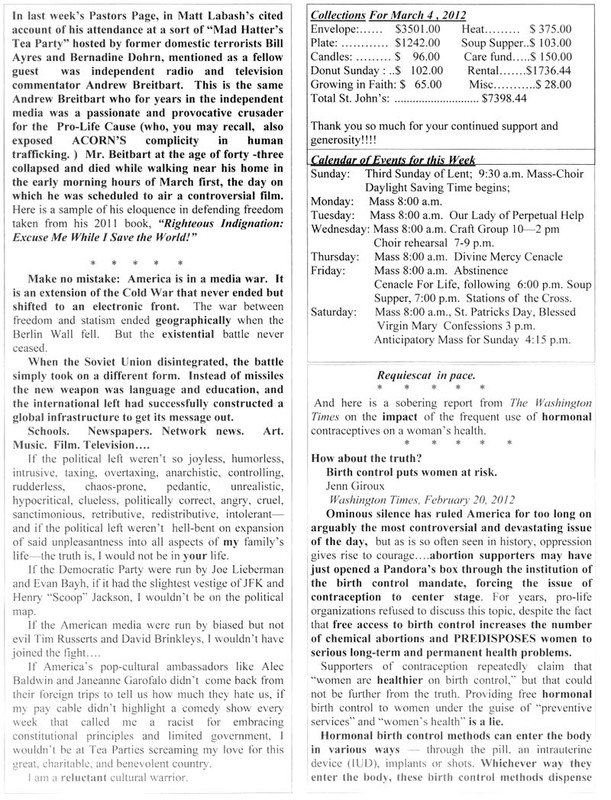 Even newspaper editorials supported us! On February 10th, the President announced that the insurance providers would have to pay the bill, not the Church’s schools, hospitals, clinics, or vast network of charitable outreach. He considered this “concession” adequate. Did this help? We bishops wondered if it would, and announced at first that, while withholding final judgment, we would certainly give it close scrutiny. Well, we have — and we’re still as worried as ever. For one, there was not even a nod to the deeper concerns about trespassing upon religious freedom, or of modifying the HHS’ attempt to define the how and who of our ministry through the suffocating mandates. Two, since a big part of our ministries are “self-insured,” how is this going to help us? We’ll still have to pay! And what about individual believers being coerced to pay? Three, there was still no resolution about the handcuffs placed upon renowned Catholic charitable agencies, both national and international, and their exclusion from contracts just because they will not refer victims of human trafficking, immigrants and refugees, and the hungry of the world, for abortions, sterilization, or contraception. So, we have given it careful study. Our conclusion: we’re still very worried. There seem far more questions than answers, more confusion than clarity. Well, for one, we’ll keep up advocacy and education on the issue. We continue to tap into your concern as citizens and count on your support. Regrettably, the unity of the Catholic community has been tempered a bit by those who think the President has listened to us and now we can quit worrying. You’re sure free to take their advice. But I hope you’ll listen to your pastors who are still very concerned. Two, we’ll continue to seek a rescinding of the suffocating mandates that require us to violate our moral convictions — or at least a wider latitude to the exemptions so that churches can be free — and of the rigidly narrow definition of church, minister, and ministry that would prevent us from helping those in need, educating children, and healing the sick who are not Catholic. The President invited us to “work out the wrinkles,” and we have been taking him seriously. Unfortunately, this seems to be going nowhere: the White House Press Secretary, for instance, informed the nation that the mandates are a fait accompli (and, embarrassingly for him, commented that we bishops have always opposed Health Care anyway, a charge that is simply scurrilous and insulting). The White House already notified Congress that the dreaded mandates are now published in the Federal Registry “without change.” The Secretary of HHS is widely quoted as saying, “Religious insurance companies don’t really design the plans they sell based on their own religious tenets,” which doesn’t bode well for a truly acceptable “accommodation.” And a recent meeting between staff of the bishops’ conference and the White House staff ended with the President’s people informing us that the broader concerns of religious freedom — that is, revisiting the straight-jacketing mandates, or broadening the maligned exemption—are all off the table. Instead, they advised the bishops’ conference that we should listen to the “enlightened” voices of accommodation, such as the recent hardly-surprising but terribly unfortunate editorial in America. The White House seems to think we bishops are hopelessly out of touch with our people, and with those whom the White House now has nominated as official Catholic teachers. So, I don’t know if we’ll get anywhere with the executive branch. And the courts offer the most light. In the recent Hosanna-Tabor ruling, the Supreme Court unanimously and enthusiastically defended the right of a Church to define its own ministry and services, a dramatic rebuff to the administration, but one apparently unheeded by the White House. Thus, our bishops’ conference and many individual religious entities are working with some top-notch law firms who have told us they feel so strongly about this that they will represent us pro-bono. So, we have to be realistic and prepare for tough times. 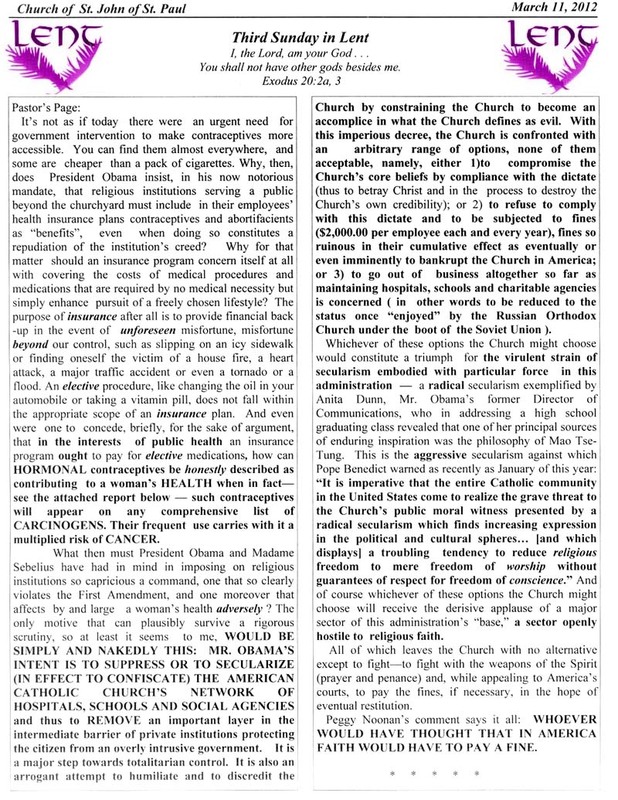 Some, like America magazine, want us to cave-in and stop fighting, saying this is simply a policy issue; some want us to close everything down rather than comply (In an excellent article, Cardinal Francis George wrote that the administration apparently wants us to “give up for Lent” our schools, hospitals, and charitable ministries); some want us to engage in civil disobedience and be fined; some worry that we’ll have to face a decision between two ethically repugnant choices: subsidizing immoral services or no longer offering insurance coverage, a road none of us wants to travel. Sorry to go on at such length. You can see how passionately I feel about this. But, from what I sense, you do too. You all have been such an inspiration, and I owe it to you to keep you posted. We need you more than ever! We can’t give up hoping, praying, trying, and working hard. This entry was posted on Thursday, March 1st, 2012 at 10:49 am and is filed under Uncategorized. You can follow any responses to this entry through the RSS 2.0 feed. You can skip to the end and leave a response. Pinging is currently not allowed.